I am pleased to see more progress towards the delivery of the V & A in Dundee with the announcement of a design shortlist. I think that this is an exciting moment and looking at the other projects which these design teams have been involved in it will be very interesting to see what they can come up with. I am looking forward to seeing project brought to fruition. This evening I attended a meeting of the board of Dundee Rep , Sweeney Todd is currently playing at the Rep, click on the picture for details. 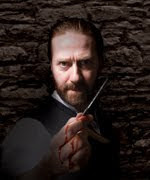 Sweeney Todd is receiving rave reviews. The board heard exciting plans for later in the year including a revival of the excellent Sunshine on Leith. The Rep aims to provide excellent theatre in the city and I was impressed by plans for action in the community including supporting a performance of Bel Canto during the community festival WestFest. The Rep is worth a visit and I urge everyone to have a look at the Rep and I am sure that they will find something that they will find interesting. Monday evening's Leisure, Arts and Communities Committee included a report about the future of Castle Green in Broughty Ferry. 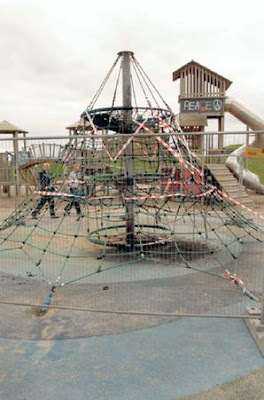 Sadly, this coincided with a disgraceful vandal attack on play equipment at Castle Green. I feel that this report is a good report it would be good if all the interested parties were able to work together to deliver on this plan. I particularly welcome the involvement of the local community in this plan. The council is merely the custodian of these resources for the people of our city. Which is why it is so frustrating that this excellent, award-winning resource has been vandalised, but we must not give into vandals we must do all we can to ensure that those who did this are caught and that we do everything that we can to ensure that we take the necessary precautions. I welcome the fact that a futher reoprt will be submitted on ensuring that this development happens. Click on the picture to see the Evening Telegraph's of these events. Monday evening saw the meeting of the City Council and its committees. The Education Committee considered a number of interesting reports. The committee agreed to spend money in refurbishing the former Rockwell school mostly in preparation for the decanting of Harris Academy to the site. I welcome the fact that efforts are being made to ensure that the former Rockwell School is fit to be used by pupils and staff from Harris Academy. I just hope that the Scottish Government can come up with the funds to allow the project to go ahead. The Education Committee also decided to change the school holidays in October by moving them back one week. Along with a number of colleagues I have some concerns about these proposals. A majority of parents when surveyed were opposed to these proposals. I am not convinced that parents might not take their children out of school outside the holidays for reasons of tradition and cost. On the basis that we received reassurances from the Convener and the Director we were prepared to let these proposals pass. The City Development Committee considered a report to set up a pilot Demand Responsive Transport (DRT) scheme. I have supported DRT for a long time I think that this is a very important development which will make a real difference to people in the city. I hope that this is a success and that that we look at rolling it out across the whole city. The Leisure, Arts and Communities Committee accepted a report on a revised scheme of operation for community councils. Firstly, I paid tribute to the many citizens of our city who give their time freely to be involved in the running of Community Councils and Neighbourhood Representative Bodies. Collectively they make the city a better place. In many respects it is unfortunate that there are not Community Councils in every part of the city and I hope that the Leisure and Communities Department will work with any group of citizens who wish to form a community council or representative body. I asked about the pilot scheme being promoted by the Scottish Government which would give Community Councils funds of £15,000 to allocate to projects in their area? Is there any indication of how these pilots are progressing and when we might hear whether the scheme will be rolled out across Scotland? The Policy and Resources Committee considered the council's new plan. I asked a couple of questions on the plan, the Labour Group are clear that we need more information about the plans of the council in these difficult times if we are to support the actions of officers and the Administration. My questions were: At the bottom p10 of the Plan it talks about 'To take account of the changing demographics, demand for services and the financial situation considerable longer term financial, asset and workforce planning will be undertaken over the next two years that will have a long term impact on how Dundee City Council is Changing for the Future.' Does that mean that we will not have the speculative fishing trip approach to workforce planning and job losses that we have seen thus far? At page 21 of the plan it talks about developing a shared services programme with other public sector bodies. The Best Value 2 audit suggested that our ability to scrutinise such shared programmes was not great. What mechanisms will be in place to ensure that there is no democratic deficit as a result of such proposals; we are involved in local government after all. I was told that workforce planning is currently happening, I have to say on the evidence of what we are told this seems unlikely. On my question about governance I was reminded that Tayside Contracts offers a valuable model for shared services. I will await plans for such co-operation and whether these plans include such robust governance arrangements. I welcome the news that a grant of £39,000 has been allocated to Ninewells Hospital in Dundee to allow for the development paths into the woods in the Ninewells grounds, planting of new trees, erection of signage, creating nature walks and installing benches. The Ninewells campus is within the boundaries of the West End ward. I welcome this funding which I am sure will be put to good use. I think that good facilities can be delivered for patients and staff and also for visitors to the hospital. Ninewells makes a huge contribution to Dundee and beyond in delivering the very best in health services, I know that in its own way this investment in the surrounding environment can also promote health and well-being. I am pleased that this facility will also be open to visitors. This is Ninewells giving something back to the local community and I hope that it is enjoyed by local people. Local people will be pleased that this gives the opportunity to improve the local environment as often Ninewells causes problems to the local environment with staff and visitors parking in the surrounding streets. This investment is welcome but I still remain concerned about proposals to cut staff in NHS Tayside, every effort should be made to protect frontline services.